Seventeen DNCBers (Roger, Mike, PB Lorna, Hans, Sheila, returnee Dave M, “lost” Marian, Marion & Marti, Anne A w/o golfer Ken, Donna, Gareth, South Slurry Al & Pauline, local Leona, “mechanically-disinclined” Jean and me) enjoyed a gorgeous, sunny and mild Monday morning at White Rock beach and pier, then Blackie Spit Park. Hi-lites included: the Willet, three Grebe species, Long-billed Curlew and Marbled Godwits, several Eurasian Wigeons, Northern Shrike and delicious PB & Banana sandwich with muffins, donut and a Butter Pecan Pie Latte. 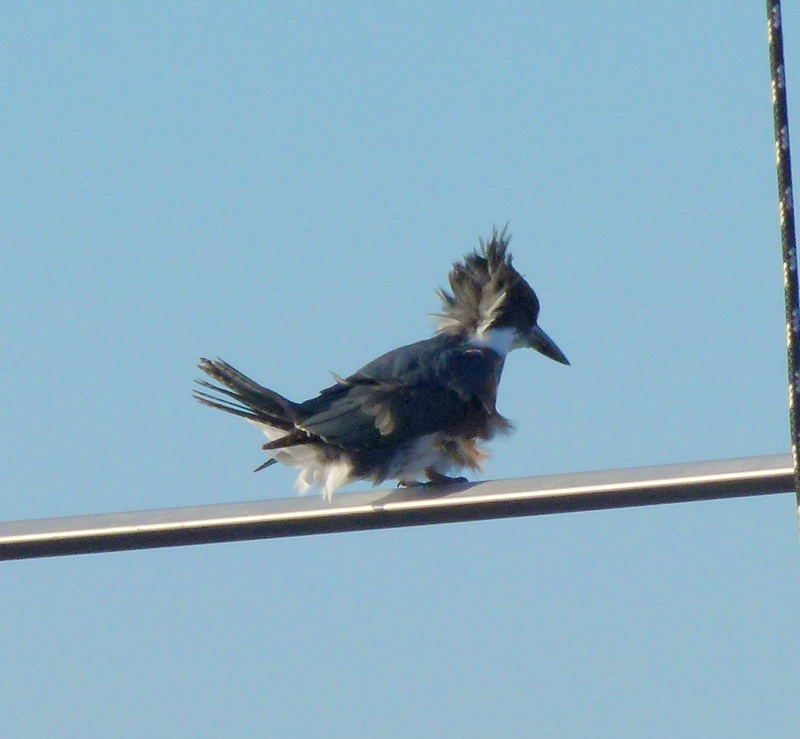 Check out photos on the DNCB Picasa link at https://picasaweb.google.com/DNCBirding. Eight of us “almost” left Petra’s around 7:45 a.m. in two vehicles with Roger and me driving. My vehicle waited patiently for meandering Marian who, after circling the parking lot in a tizzy, decided to drive alone (poor car-pooling technique). 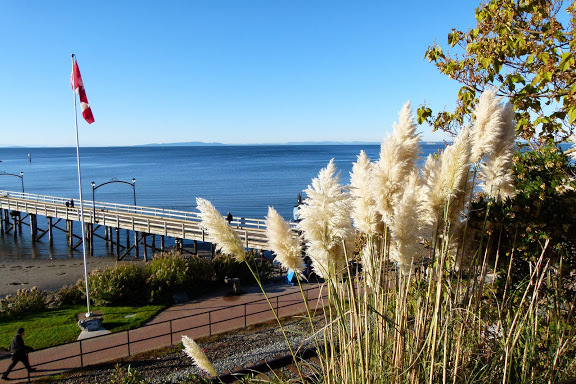 Anyhow, we all arrived at the parking lot above the White Rock pier before the scheduled 8:30 a.m. meeting. The sun was rising brilliantly, so we decided to follow the walkway past the White Rock in search of the Willet and Black-necked Stilt. Some walked ahead while others, for some unknown reason, were enamoured with a passing train. The tide was out, but coming in, and we found the Willet among some American Wigeons (plus the first of several Eurasian Wigeons seen today) and Canada Geese. The Stilt has apparently left the area. A mixed flock of Mew and Ring-billed Gulls was nearby as were a few Killdeer. We returned to the pier and walked to the end, along with seemingly hundreds of others enjoying the morning. Along the way we got good looks at Horned and Red-necked Grebes, Northern Pintails, Surf and White-winged Scoters, Pelagic and Double-crested Cormorants and Common Loons. Western Grebes, a Red-throated Loon and several Buffleheads were a bit further out. Just Washed Feathers…and can’t do anything about it! Two noisy female Belted Kingfishers posed, which pleased PB Lorna. A pair of Bald Eagles caught our attention as they danced together in a fly-over. Roger took the obligatory Group Photo at the end of the pier before we all hustled back to the parking lot to avoid the Ticket Police at 10:00 a.m. Some drove directly, others (Roger who?) circuitously to Blackie Spit (BS). Another brilliant Eurasian Wigeon was at the beach by the BS parking lot, discovered by weary-looking Jean who claimed car trouble for her late arrival. Entering the Spit gate, there were lots of ducks in the Nicomekl River, mostly Wigeons, Mallards, Pintails and Green-winged Teal. A few Black-bellied Plovers were nestled among the ducks, and Killdeer were in the grass. A Northern Shrike flew in front of us, landed in some bushes where it was harassed by scared Starlings, before taking off. Because Anne A asserted, to avoid the wrath, we decided to walk into the Park rather than out to the Spit. Roger was impressed by a couple of House Finches, which he unsuccessfully tried to turn into Purple Finches. Some saw a Bewick’s Wren, and Gareth later claimed he saw American Pipits. 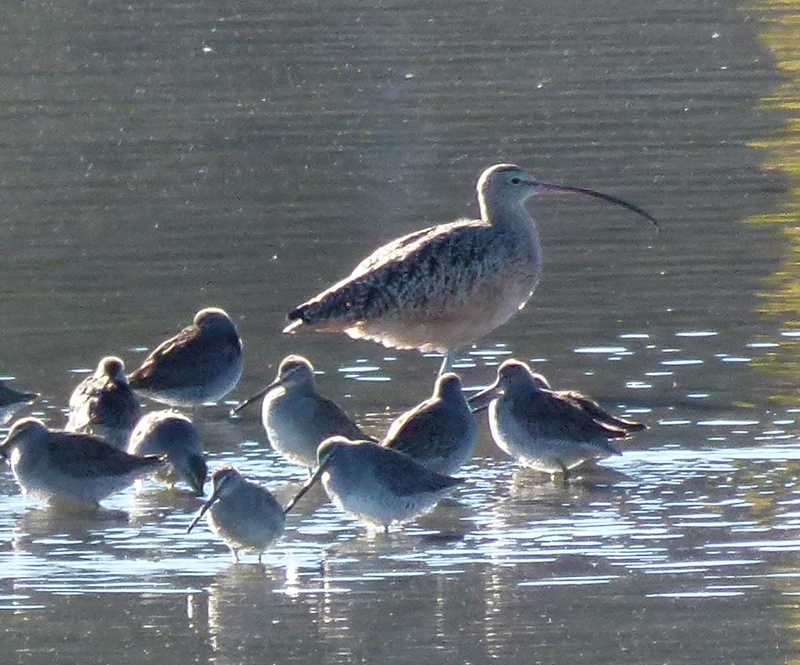 Near the Purple Martin pylons, we found the Long-billed Curlew, surrounded nicely by Long-billed Dowitchers. Greater Yellowlegs, and apparently a Lesser according to Gareth, were in these mud flats with the dowitchers and ducks. Renowned Assistant Director and former Reifel employee, Deborah, led us to two Marbled Godwits which were also nestled among more ducks on the Nicomekl shore, along with a few more Black-bellied Plovers and Wigeons, including Eurasian. In the distance, we noticed several swarms of Shorebirds weaving over the water (Dunlin, Plovers, Sandpipers?). Wandering back to the parking lot, searching in vain for the Shrike, a couple of Northern Flickers were accommodating. Approaching Noon at the parking lot, teary-eyed Marian handed me a banana and a delicious custard-filled donut, compensation for her waywardness. This was graciously accepted and complemented PB Lorna’s always-delectable PB & banana sandwich and muffins. Then, the coup de grace was a large cup of Butter Pecan Pie Latte at the Empire Coffee Shop where eight of us went for a post-birding experience. Al, Gareth and I were entertained watching the five “chicks” serenading our newbie youngster Dave. Another awesome DNCB morning. 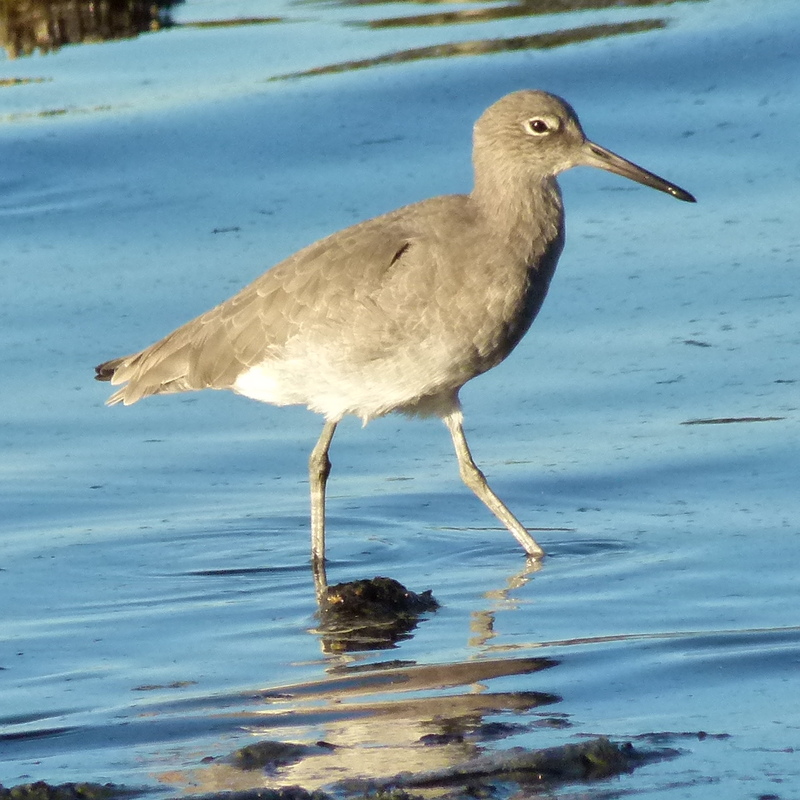 This entry was posted in American Pipit, Blackie Spit, Long-billed Curlew, Long-billed Dowitcher, Marbled Godwit, Northern Shrike, White Rock Pier. Bookmark the permalink.